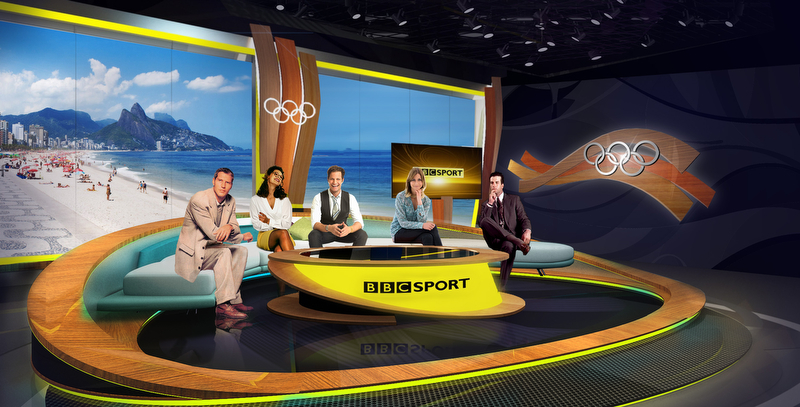 With a streamlined presence at this years Olympics, compared to 2012 when London hosted the games, BBC opted to leave the International Broadcasting Center for its main studio setup, anchoring coverage from the beach. 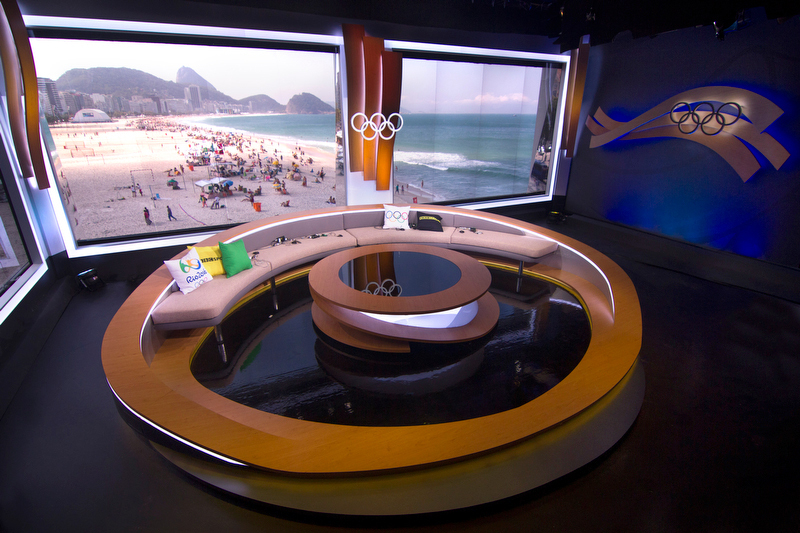 Aiming to maximize the view of Copacabana, BBC went with a minimal set design from StudioBound Creative, Patrick Larsen’s new multidisciplinary design firm which is based in Singapore with a focus on broadcast television, theatre and theme parks. Studio during evening broadcast on BBC. The studio was designed to provide flexibility across BBC and BBC Sport coverage, allowing a variety of accommodations for guests and looks throughout the day. “The studio is being used for over 15 hours a day across two network channels, therefore the ability to subtly change the look was a big driver for BBC,” noted Larsen. Additionally, the set had to be completely fabricated in the United Kingdom by Spectrum Exhibitions and Pico UK, then shipped via boat to Brazil for reassembly. “One of the difficulties of course is that you have to work with clever carpenters that can build the scenery in pieces that can ship economically but also take into consideration the seams and joints so that it doesn’t look like it was made from legos when its all put back together,” said Larsen. The studios design works to capture the landscape of Rio de Janeiro while emphasizing the unique view it has from the broadcast tower on the beach. Design rendering. Courtesy of Studio Bound Creative. 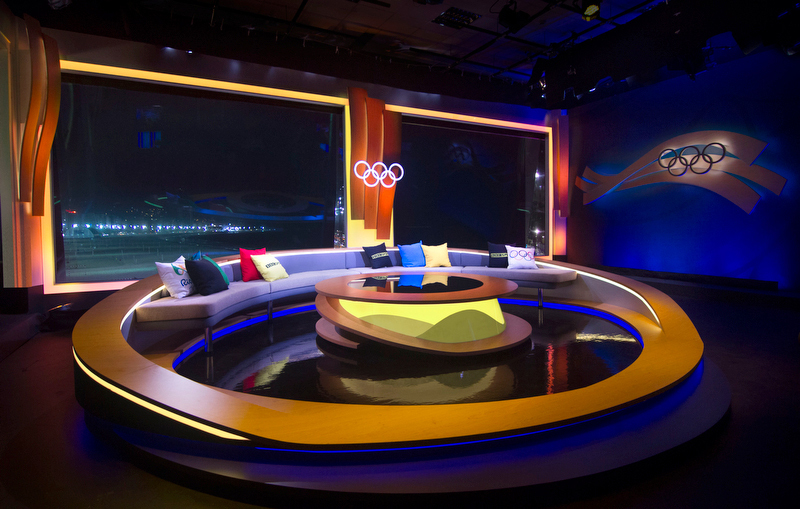 “We tried to capture some sense of the rolling landscapes of Rio – as well the graphic look and feel of the 2016 games- by using curved and bent wood forms that compliment the windows and corners of the set,” explained Larsen about the design. Along with featuring the Olympic rings, the studio also has subtle nods to the games. With minimal elements, material selections were an important part of the design, as they work to emphasize a sense of place in the design. Larsen also had to work with BBC Sport’s unique yellow and black color palette. The sets lighting design, by David Gibson, worked to balance the indoor studio space with the outdoor view. “The large windows of the set create immense challenges for broadcast. Particularly in a place like Rio where the sun can be very intense and often changes dramatically throughout the day,” said Larsen. To combat the elements, Larsen worked with Gibson on a series of neutral density panels that could track in and out based on light conditions, allowing the cameras and lights to balance the background of the beach with the presenters in studio. Additionally, the sets design included RGB LED’s in the “corners and cracks” to define contours and create depth. 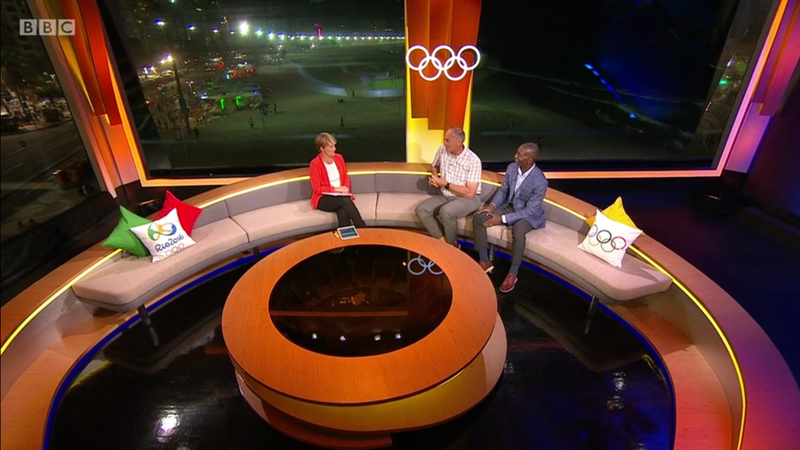 Like many of the 2016 Olympic broadcasters, BBC’s coverage utilized augmented reality graphics, provided by Deltatre, to enhance the story and breakdown the data. 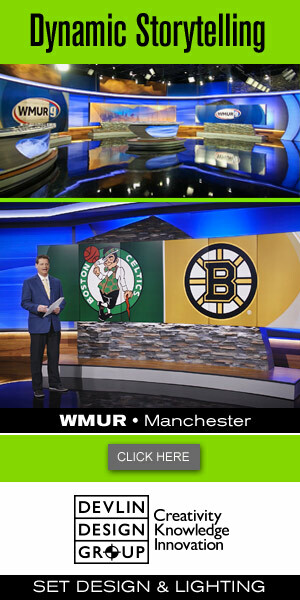 The studios design strategically accounts for this by leaving space in front of and next to the presentation pod for AR graphics to appear on air.